The US lender, CIT Group, has filed for bankruptcy protection, after a debt-exchange offer to bondholders failed. However, the majority of bondholders have agreed a reorganisation plan that will reduce CIT's debt by $10bn (£6bn) while allowing it to go on operating. 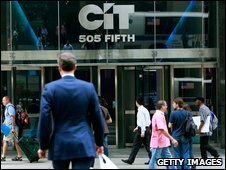 The group's operating subsidiaries, including CIT Bank, were not included in the bankruptcy filing in New York. CIT Group suffered as the credit crisis left it unable to fund itself, and the recession exposed it to many bad loans. Under the reorganisation plan which has been approved by bondholders, creditors will end up owning the company. Most bondholders will also end up with new CIT debt worth about 70% of the face value of their old debt. Preferred shareholders, including the US government, will get money only after other creditors are paid back. The government invested $2.33bn in CIT shares in December 2008 through the Troubled Asset Relief Programme (Tarp). It could have lost more, however, had it not declined to give more aid this year. "The decision to proceed with our plan of reorganisation will allow CIT to continue to provide funding to our small business and middle market customers, two sectors that remain vitally important to the US economy," said CIT's chairman and CEO, Jeffrey Peek, who will step down by the end of the year. CIT's bankruptcy protection filing, showing $71bn in finance and leasing assets against total debt of $64.9bn, is the fifth biggest in US corporate history. Many observers predict that if CIT is able to continue in business after emerging from bankruptcy protection, it will not be able to make anything like the same number of loans to small businesses. That could mean that thousands of companies which are looking to raise money for investment will struggle to find the cash, they warn.